The greatest Catwoman survives a health scare. As much as I admire the greats like Lee Meriwether and Eartha Kitt (not to mention fine performers like Michelle Pfeiffer and Anne Hathaway), Julie Newmar will forever be the greatest Catwoman. I’ve been fortunate to become long-distance friends with Julie over the last few years, through formal interviews and informal chats over the phone — she in California, me in New York. Every conversation is a pinch-me moment, not just because I get to sit there and talk with this legendary actress but because she’s as warm and engaging as you’d hope she’d be. Feel free to click here and here for a couple of those interviews, where she talks about life in Gotham — and beyond it. I think they’ll give you a really good idea of what a wonderfully warm woman she is. She will always be the one true Catwoman. Get well soon! My mother, Kathryn Lusich, was Julie Newmar’s accompaniest during her dancing lessons, and had the greatest affection and respect for her and her mother. Wishing Julie Newmar the best of everything. She deserves it. JUlie, best wishes from Brazil…hope you recover very soon!! Sad to hear that she had a heart attack,for we’re all very lucky that she survived it and that she is still alive. “Pinch me” moments are awesome! I hope she gets better soon. Love you,Julie. My Catwoman. Get well, stay well. My childhood idol! She’s so awesome! Glad she is doing better! 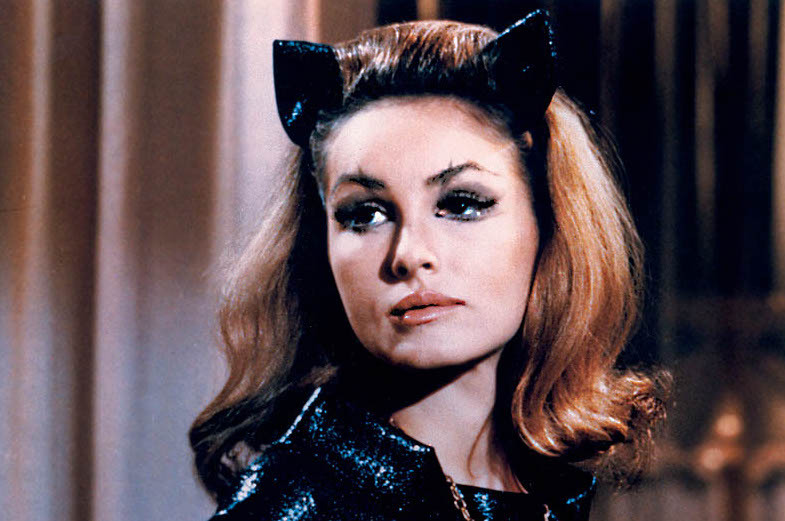 Agreed — with all love and respect for Meriwether, Kitt, Pfeiffer, and Hathaway, Julie Newmar is to Catwoman what Christopher Reeve is to Superman: the high-water mark that will never be topped. Speedy recovery, Julie!